Tripunithura: For the first time in the history of Vrischikolsavam at Sree Poornathrayeesha temple, Thrikketta Purappadu was held without the age-old customary gold caparison. “The gold caparison was offered by our great grand father and it is unfortunate that they could not have it this time,” S Anujan Thampuran, the former secretary of Valiyamma Thampuran Kovilakam Trust and Kochi royal family member said. The Cochin Devaswom Board (CDB) decided to melt the precious century-old caparison to find extra gold needed for a proposed new caparison, a move which was stayed by the Supreme court. “We had offered gold needed for the new caparison yet it was not considered. Without considering the mass request duly signed by senior members of Kochi royal family including 90-year-old Hymavathy Thampuran, CDB destroyed the invaluable gold caparison,” Anujan Thampuran said. He said what the devotees witnessed on Thursday evening was an ordinary caparison without any conventional royal symbols of age-old caparison. “It was just another ordinary ‘Choorappoli’ model caparison hired from contractors,” V Krishnanath, a devotee who queued for hours to offer the ‘Kaanikka’ in the golden pot said. “We fear in the coming years CDB may alter the golden pot or golden umbrella by melting it,” he said. 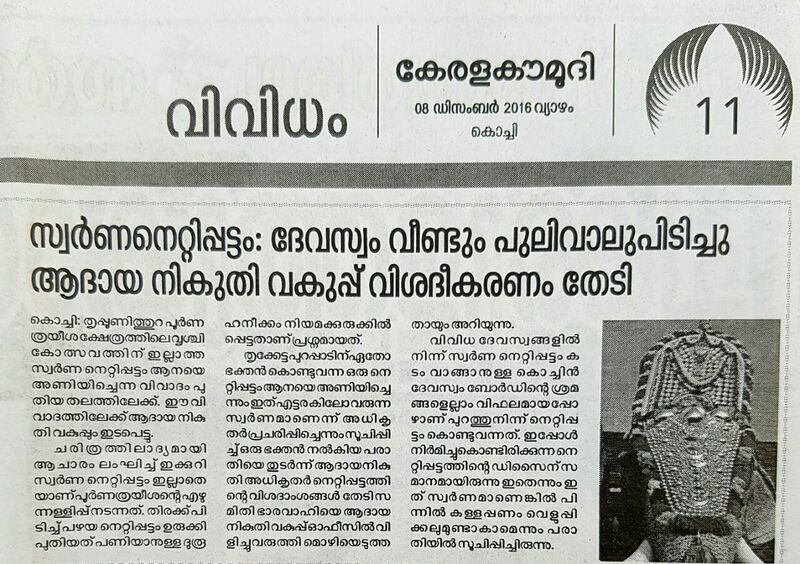 E K Ajayakumar, devaswom officer of Sree Poornathrayeesha temple said that due to a year long legal battle between CDB and Kochi Royal family, there is an uncertainty prevailing over the making of new caparison. “We tried our level best to get a gold caparison either from Oorakatthamma Thiruvadi temple and Irinjalakuda Koodalmanikkyam temple, which did not work out. The Oorakam temple committee and locals strongly protested against taking out the precious gold caparison from the temple,” he said. Jayan Mankaayil, president of Seva Sangham said they had brought the gold caparison for Thrikketta from an individual who owns this gold caparison. CDB refused to say anything about the duplicate by saying that the same was brought by Seva Sangham.